During the early Return Of The Jedi releases, the image on this figure's card was replaced with a new image. 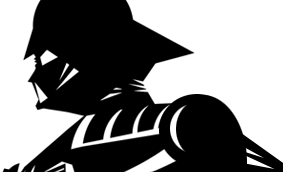 Though known examples indicate that the switch took place during the 77A production run, It is possible that earlier examples could exist. The original photo made its last appearance on the Return Of The Jedi 65C back.Note that the distinction of 65D and 65E cards is the Anakin figure offer stickers, the 65C was the last printed 65 back variation. The new image was used on all other cards after including and Tri-Logo card. 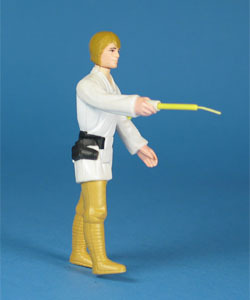 Major Variations: The Luke Skywalker figure has more variations than most other figures in the vintage line. The major variations are the spray ops on the figure's head. This figure is commonly available with yellow hair, but also shipped with dark brown hair (primarily in North America) and light brown hair (primarily in Europe). There are two versions of the Lightsaber. The first version (primarily packed into the Early Bird set* and scarcely on the Star Wars 12 back card) was made of two pieces and featured a double telescoping action. When weighing out playability versus cost efficiency, the double telescoping version was replaced by the much more common single telescoping Lightsaber. * Though most Early Bird sets did come with the double telescoping Lightsabers, there are some documented specimens packed with the common single telescoping version. Although there are currently only two documented specimens, this figure was also produced with reddish blonde hair. To date, not much is known about its availability.